In America, winning the Presidency has proven to be a question of how much money you're willing to spend. The trend constantly shows that, he who spends the most money on elections usually wins. money to a candidate. Since the candidate who raises most money, usually wins... the election is up for the highest bidder. Political Action Committees (PAC's) are created to collect donations from employees & people in their circle, then donating it in bulk to the candidate or spending it some other way for the candidate. Each person is limited to max $2500 dollar donation per Presidential Candidate. Corporations themselves can NOT donate directly, so they organize around it. per person, per candidate, but the Campaign finance laws are confusing and full of loop-holes. SuperPAC were created after 'special interest' people managed to change the law allowing PACs (Political Action Committees) to donate virtually any amount of money to the candidates the SuperPAC supports. The SuperPACs are not allowed to 'coordinate' with the election candidates, but are usually run by former employees of candidates. The SuperPACs often keep their donors lists secret. They spend the donated money mostly on negative 'attack' advertising on candidates they don't like. They can't directly give money to a candidate. 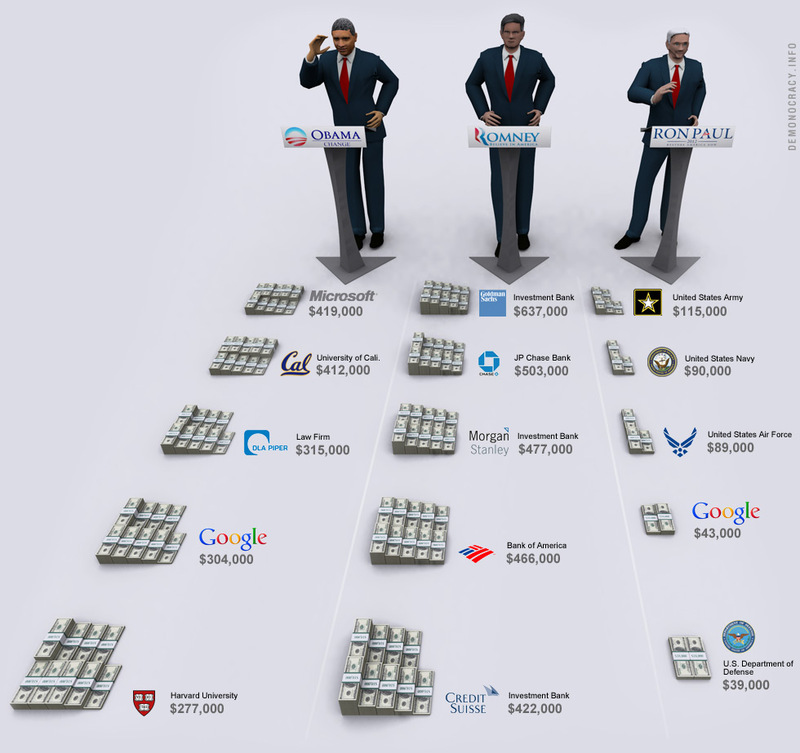 SuperPACs and who donated to them. Keep in mind these are OVER 800 SuperPACs in USA. They had raised more than 349,000,000 on August 24th, 2012. 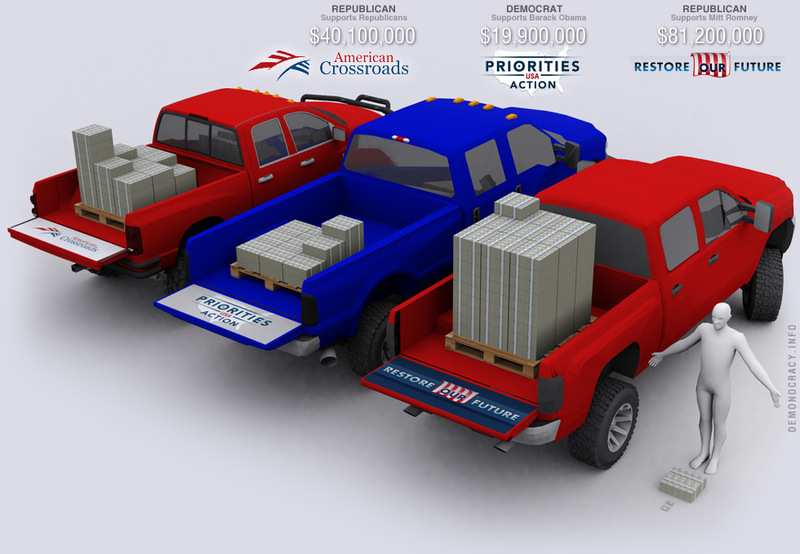 Click on the graphics below to see the top donors for American Crossroads, Priorities USA Action and Restore Our Future. The data is from August 2012 and the same donors have contributed much more to the US Election. 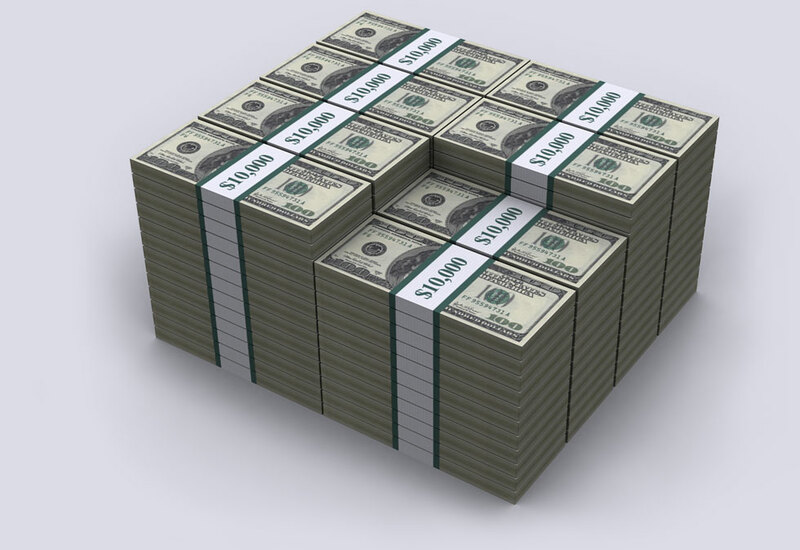 Billionaire Sheldon Adelson, a Republican, has pledged to donate up to $100 Million Dollars to Mitt Romney. These are no ordinary sums of money and there is no such thing as a free lunch. The President who's recipient of such large sums of cash will likely owe a lot of favors in the future. .
Click on graphics below for larger view. 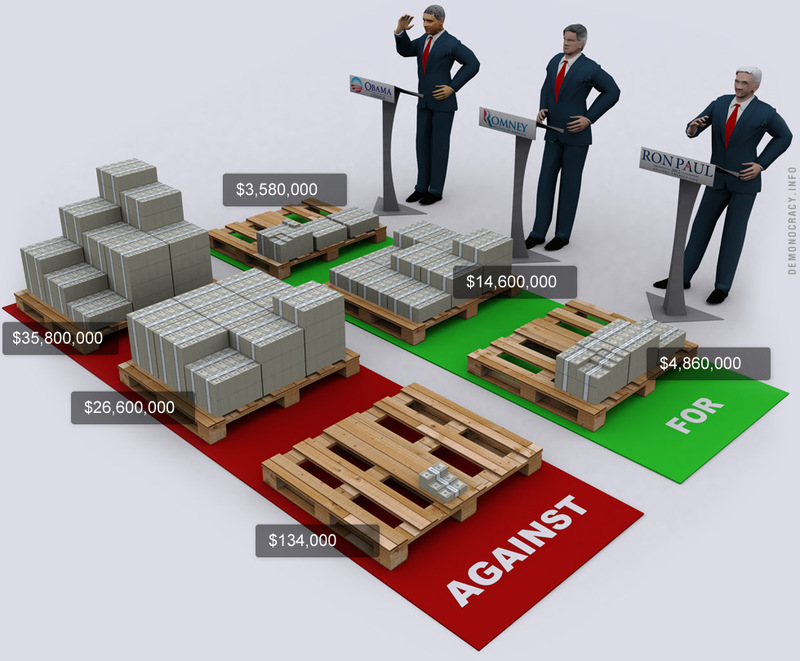 SuperPACs spend their money on advertising that attacks or defends a presidential candidate. They usually use the their raised money for negative ads, destroying the candidates that oppose their agenda. Obama is getting 'attacked' the most by negative SuperPAC ads. Mitt Romney got $14.6 million of positive ads from SuperPACs. 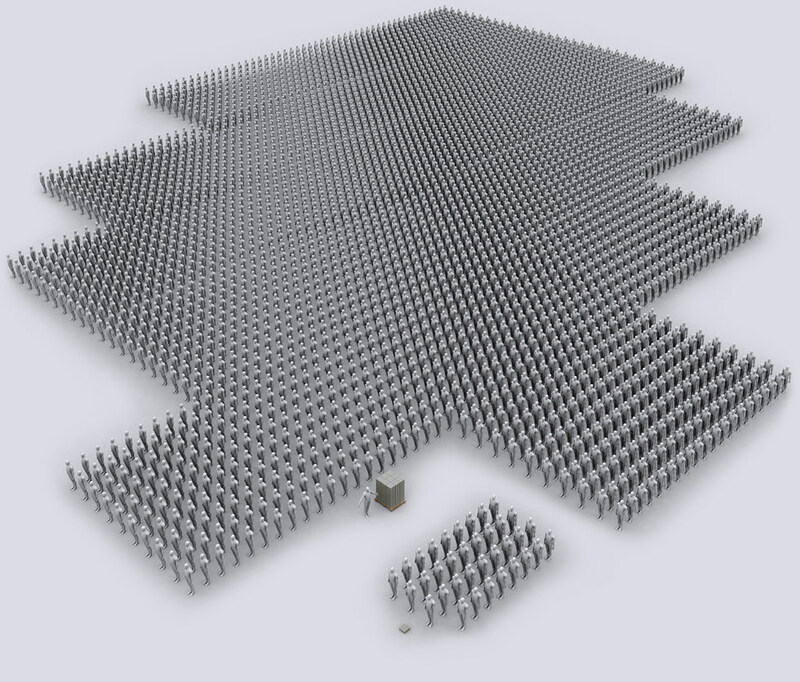 Super PACs spent $4.86 million on positive ads for Ron Paul, and only $134,000 on negative ads. 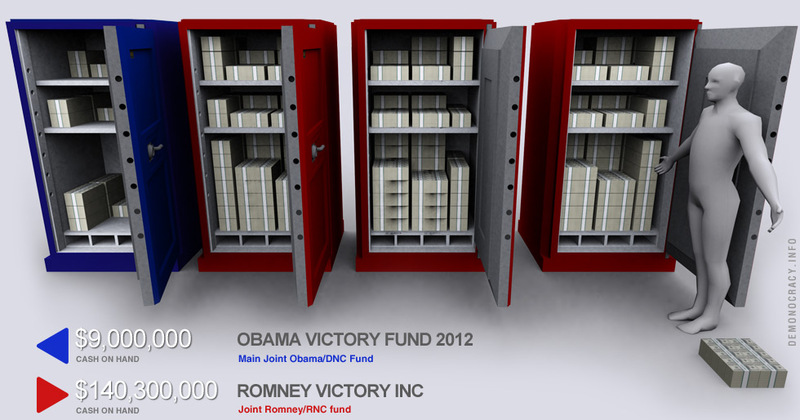 Romney & Obama have set up joint funds with the Republican and Democratic National Committees. and PACs may give up to $30,800. If the donated money is above the limit, it is diverted through clever schemes and loopholes. Romney's fund raised $140 million between April and July 2012. Always good to have some extra cash around. These guys are in charge of providing national leadership for the Republican and Democratic parties. They are also responsible for coordinating fundraising and election strategy -- serious stuff. The committees also have money to spend to influence public opinion, in order to make sure their buddies win. 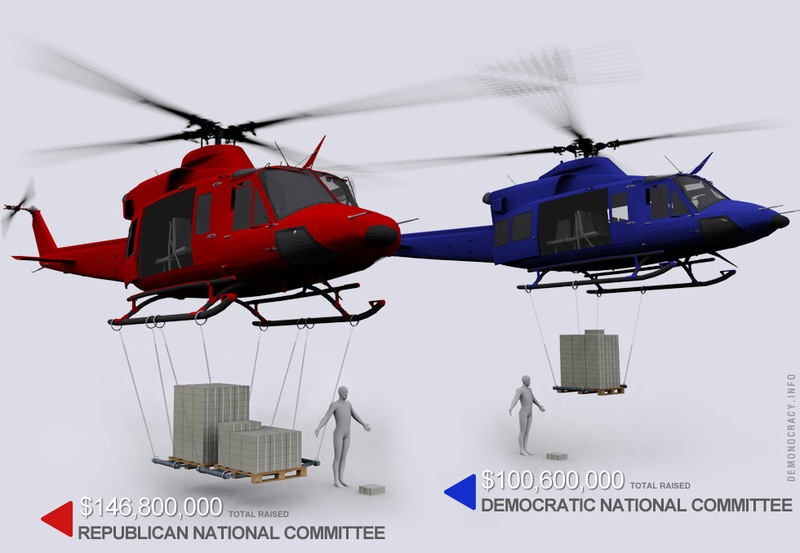 Here at Demonocracy.info we have provided the Committees with helicopters so they can heli-drop much needed cash, where distorting public perception is necessary to achieve mission of taking control of the world's most powerful nation, military and nuke arsenal.